Furthermore, CNIL considered that the collection of personal data related to hourly consumption was not necessary for the performance of the contract entered into by the customer, which only requires the supply of electricity, billed on a monthly basis. With regard to legitimate business interests pursued by the company, CNIL found that according to the information notice provided to customers, the collection of hourly consumption data would allow a more precise billing, “but that the automatic collection of this data, which is particularly intrusive and detrimental to their privacy, disregards their interests and rights, especially since there are no tariff offers based on their hourly consumption.” For these reasons CNIL concluded that the smart meter granular data collection had no legal basis as it was not based upon valid consent . Although the CNIL decision was based upon French law, it has implications for the entire European Union (EU) as it applies the same principles to be implemented in May 2018 as part of the EU’s General Data Protection Regulation or GDPR . The rationale used by CNIL in France is also nearly identical to the arguments made in the United States in the court case of Naperville Smart Meter Awareness (NSMA) v. City of Naperville and where failure to obtain a valid customer consent for granular smart meter data collection represents an illegal, unwarranted, and unreasonable search in violation of the Fourth Amendment . Utility companies in the United States then try to extrapolate the monthly aggregate readings legal argument to granular data collected by a smart meter by saying that it is the same thing, just more frequent. But this is not true since more granular data collection fails the test of not revealing discrete information about a customer’s activities. Privacy groups Electronic Frontier Foundation (EFF) and Privacy International (PI) have a way to explain this concept, that smart meter so-called “aggregate data” are actually disaggregated by time and do therefore reveal intimate details about what is going on inside the home . It is hoped that the French decision by CNIL can further move the needle in the direction of protecting consumer privacy interests in the United States and other places worldwide. See State v. Kluss, 867 P.2d 247, 254 (Idaho App. 1993) (finding that monthly aggregate power usage figures “do not reveal discrete information about Kluss’s activities” because they may be caused by any one of numerous kinds of electrical usage”); accord Sampson v. State, 919 P.2d 171, 173 (Alaska App. 1996) (Mannheimer, J., concurring) (agreeing that no reasonable expectation of privacy exists in gross monthly electrical usage figures, because such figures “reveal no details of the activities that consumed the electricity”). I keep getting telephone call asking me if i want to change my meter to a smart meter and i keep telling them the same NO! I wish I lived in France instead of Illinois where stupid meters are mandatory. Since I was declared disabled in 2015, due in part to my hypersensitive to RF and microwave radiation, I am proposing a bill where I can opt out of stupid meters. I would appreciate others like me to respond to this comment. Do more research! You do have a choice! Just say NO! Refuse the meter! Protect your analog from “accidentally” being replaced with a smart meter. Protect your privacy! Protect your health! If you dont reject it they have obtained your tacit acceptance. We DO NOT want this! Easier said than done, i.e., people have said no where I live and were arrested; others simply have their power disconnected when they refuse. 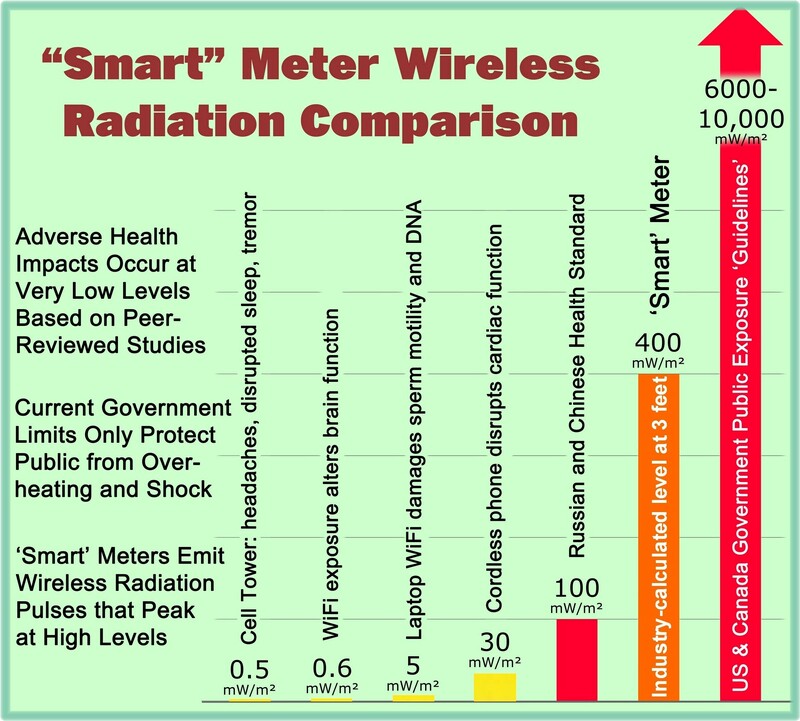 Bravo for all those fighting to preserve our basic human rights to privacy, safety and health which these smart meters and smart grid in general seem to quite obviously violate. This must be stopped! Part of the problem (supposedly) is our legislatures taking money to NOT abide by their sworn oath of office to protect and defend the US Constitution. I wouldnt be surprised to find it’s a fact. Just say NO!